Dinner & Entertainment at Govinda's! ~ The Toronto Hare Krishna Temple! Dinner & Entertainment at Govinda's! Govinda's Dining Hall is introducing a new monthly program, where once a month your dining experience will be accompanied by live entertainment! The first event will be taking place this Saturday, April 10, 2010. In addition to Govinda's famous vegetarian buffet, the evening will feature a musical performance by Gaura-Shakti. 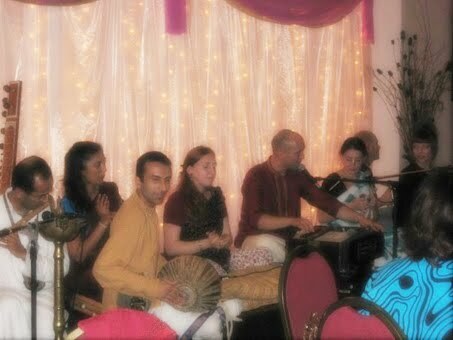 Gaura-Shakti is a Toronto-based kirtan yoga group with experienced musicians that hail from all around the world. Invoking ancient mantras and using beautiful instruments Gaura-Shakti will help take you on a sublime spiritual journey! The performance will begin at 6:30 pm at Govinda's Dining Hall, $12.00 per person includes vegetarian buffet. Future monthly programs will feature classical Indian dances, dramas based on classical Indian literature and more!